Undersea Explorer run a shark dive at this location. Just to the north of the mooring is a largish bommie. On the top of this is a bit of chain and some floats. This is a shark listening station, although the device is not always there. As you descend you will see that there are a lot of sharks milling around. These obviously know that something is about to occur. The crew of the Undersea Explorer will set the divers up against the wall around two sides of the amphitheatre that sort of surrounds the bommie. Once everyone is in place, the crew bring down a couple of joined milk crates which have the remains of fish used for making a previous dinner. This is placed on top of the bommie and soon all hell breaks loose. Small fish attack the crates followed by sharks. Even a potato cod will come in and try to extract some fish remains from the crates. Even though the remains are totally within the confines of the crate, some of the fish and sharks are able to grab bits of the fish remains and pull them out. 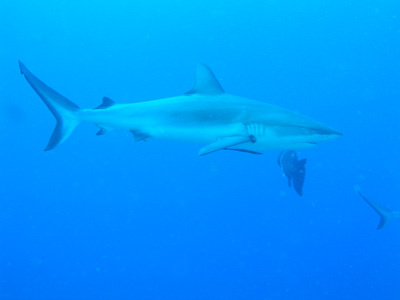 The lucky sharks take the food and quickly swim away to lessen the chance of any other shark taking the food off them. As well as all these fish, there are two very large yellow-edged moray eels that live on top of the bommie. These try to get the fish remains out of the crates and look for any bits dropped by the sharks. The sharks come in and around the bommie, enabling you to get some close up photos. After it has calmed down a little, the crew will take divers in pairs up close for an even more exciting thrill. A minute or two and it is other divers turn. 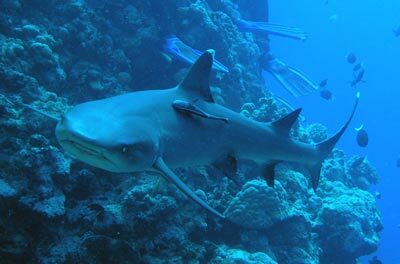 As well as white-tipped reef sharks, you may see silver tips and grey reef sharks. These last sharks are much larger and more fierce looking. After the crates are taken back to the boat, go up to the top of the bommie and you will be able get some great photos of the moray eels (which are very friendly) as well as the sharks which are still circling. 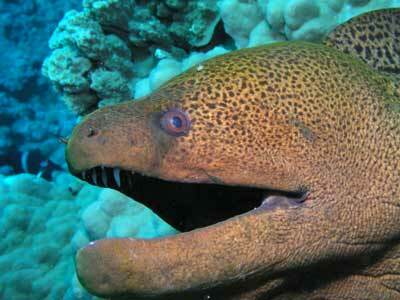 The largest moray has a deformed jaw and the top half sits to the right of the bottom jaw. After this, do a bit of exploration as per the North Horn dive. 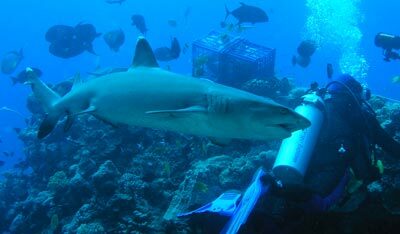 A very good shark dive, the best I have done in Australia, but not as good as the old shark feed at Bokissa Island in Vanuatu (not run now) or the shark dive in Chuuk Lagoon. 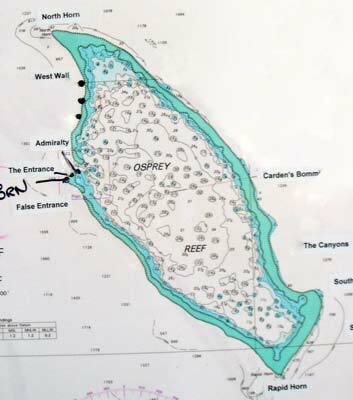 I have two other dive descriptions for this location, see North Horn and North Horn Drift Dive. Visibility here is nearly always at least 40 metres.